If you use a standby generator during power outages, remember that improper generator hookup can create serious problems with safety, and the operation of the generator. 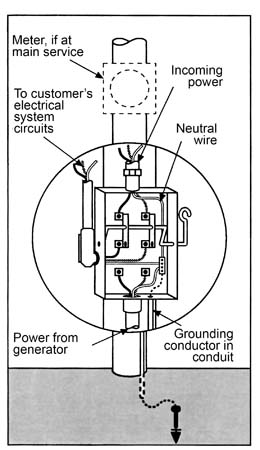 It is important that your service have a double-throw switch to isolate the generator from the EMC’s power lines. If it is not isolated, voltage from the generator could be back fed onto the lines where it would endanger the lives of our line technicians. The most common way this could occur is if you directly connect a generator to your electrical panel or to a circuit in your home.